Where to Buy Display Cabinets Today? Our Quick Ship Warehouse Has Them In Stock! 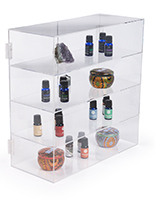 This Affordable Display Cabinet That is Made From Acrylic Works Great in Both Residences and Businesses! 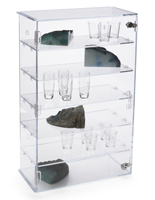 This display cabinet is engineered with Lucite, which happens to be both tougher and less highly priced than glass. This means that our company can confidently present this exposition case to you at a lower rate than a conventional glass exposition case. The doors of this display cabinet are hinged to make adding and removing the merchandise on the inside a simple matter. 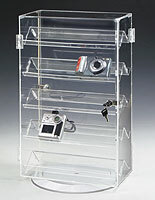 Each one of our Lucite cases has a cam lock attached to the door to shelter your products from theft. By being capable of shutting and sealing this case you are capable of sheltering your valuables from dust and other mischief they could acquire if they were merely located on a table without any protection. These display cabinets can be utilized with the lockable doors facing either the clerk or the clients, contingent on what your requirements are at the time. If you change your mind or decide to rearrange the exhibit, the acrylic exhibit is easy to carry so that moving it or changing its orientation is simple! 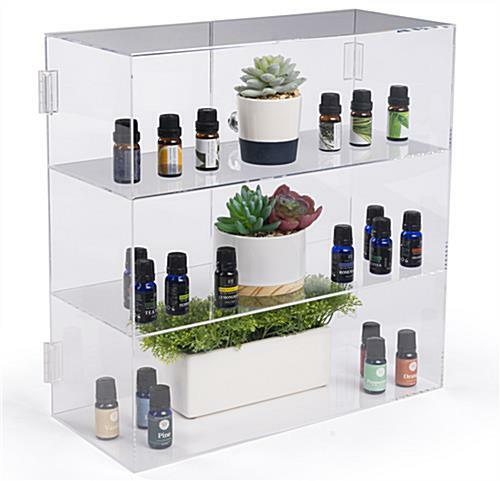 Regardless if you're setting up a residential exposition of your memorabilia, creating a display for an event, or utilizing a countertop at your shop to accentuate unique pieces, this display cabinet will flaunt your products with a contemporary touch! 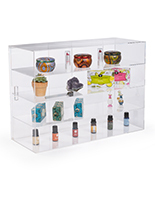 This countertop exposition case measures 16.5"h x 16.25"w x 7"d, and has two Lucite shelves on the interior of the casing. The three exposition surfaces are 5 1/4" high, giving you the ability to show items with some dimension, like cumbersome watches or leather wallets, smaller statuettes or signed baseballs. 16.5" x 16.3" x 7.0"